We are going to simulate time series using basic function in python. This is the first post of a series I’m going to write on signal processing, machine learning and data analysis stuff. We will use also Matplolib http://matplotlib.org/ to produce plots. Matplotlib is an excellent python library to produce any kind of plot you want. 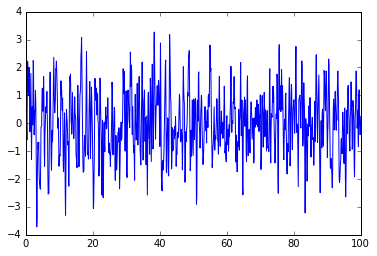 We use the numpy function random.normal to add Gaussian Noise with amplitude sigma. Now, let’s do something more complex and simulate the time series using an AutoRegressive Moving Average (ARMA) model. The Notation ARMA(p,q) indicates and AR part with p poles and MA part with q zeros. where w is a white noise with unit variance. We can do this in many different ways and using different python library, such as scipy and its module signal, or you can write all the code from scratch. I want to learn more about this library StatsModels: http://statsmodels.sourceforge.net/. So I’ll learn with you how to do signal processing using statsmodels.